+222% sur le mois de mai 2011, comparé à l'année précédente, et +500% comparé au mois précédent. …support seems to be coming from the physical gold market, especially Asia. This segment of the gold market has been buying gold in dips for the past few weeks, and this trend seems entrenched. In fact, we have seen exceptionally strong physical gold demand so far this year (compared to the same periods in 2009 and 2010). India to import 350 tons of gold, 1200 tons of silverNEW DELHI (Commodity Online): India’s state-owned trading company—Minerals and Metals Trading Corporation (MMTC)—said on Thursday that it would import 350 tons of Gold and 1,200 tons of Silver in 2011-12 as demand for the precious metals is rising fast. "We plan to 350 tons of gold and 1,200 tons of silver in the 2011-12 fiscal as the domestic demand for these metals are fast rising," MMTC Marketing Director Ved Prakash told reporters. India is one of the largest importers and consumers of gold and silver in the world. As the domestic production of these precious metals is negligible compared to their rising consumption, India has been importing hundreds of tons of gold and silver every year. Prakash said that import of gold by MMTC in the current fiscal is expected to increase by more than 40 per cent with the yellow metal fast emerging as a safer investment option. "We are stepping up import of Gold this fiscal due to rising demand for the nobel metal. Also, its value as a safe option, in the current volatile market, is rising," he said. The company almost doubled its import of gold at 45 tonnes during the April-June quarter this year compared to the same period last year, he added. He said besides gold, the demand for Silver is rising as it gives better returns. Silver prices have been touching new peak in India thanks to robust demand amid short supply in the global market. Majority of silver in India is used in the production of ornamental items like jewellery, utensils and gift articles. Every year, India buys more than 4,000 tonnes of silver and over 960 tonnes of gold. * Reuters, citing Bombay Bullion Association President Prithviraj Kothari, reported that gold imports by India plunged 56% to 125 metric tons in Q4, as record high prices and high interest rates hit demand. * Reuters pointed out that Q4 covers the peak festival and wedding season, when demand for gold is traditionally the highest. It added that it is rare for gold demand in the last quarter to remain below Q3 consumption, which occurred this year. * The article noted that one reason behind the weak demand in the last quarter was the increase in purchases during the first nine months, when investment demand rose 22.5% from a year earlier. * India imported roughly 878 metric tons of gold in 2011, down from 958 metric tons in 2010. Silver has arguably become the investment product of choice these days and with more banks allowed to import both the precious metals, banks in India are exploring the option of launching higher denomination silver bars in addition to gold. In a major fillip to the world's biggest consumer of precious metals, India's central bank, the Reserve Bank, has allowed four more banks to import gold and silver in the country. This brings the total number of banks allowed to import bullion to 35 in India. Bankers say the ensuing heavy competition is all set to bring on heavier discounts for consumers. "Competition creates transparency in the price and could result in lower premiums. Ultimately, the customer gets the benefit, since each bank will try and woo them to their offered price,' said Prateek Vyas, senior official with bullion importing IndusInd Bank in Mumbai. As if in tandem, silver spot prices on the Bombay bullion market jumped by $6.31 to touch $994.55 in the early hours of Tuesday. Bank of Maharashtra, Yes Bank, Union Bank and ING Vysya Bank have been included in the list of banks allowed to bring in the precious metals. Gold and silver is still tightly regulated in the country with the Reserve Bank nominating certain state run and private sector banks to trade in bullion. The measure has come as a huge relief to retail buyers who have been awaiting some action from the Reserve Bank. "This will result in a major jump in demand from the consuming class. Many buyers have been looking forward to a lower price to get back nto the market and this move will spark it off,' said Suresh Hundia, of the Bombay Bullion Association, which is a premier trade body. Prithviraj Kothari, president of the Association, said the new bank mandate could help increase purchases of both gold and silver. "Though gold is an all-time favourite, silver imports into the country are set to cross 3500 tonnes in 2011. In 2010, India imported 2800 tonnes of silver,' he said. Banks normally charge 15% premium to the market rate. Stating that banks would have to work and cut down on their premiums and not couch it as a discount to the loyal customer, Kothari said the silver market was looking good in the first quarter of 2012. "We should expect 400-500 tonnes of silver imports in Q1. 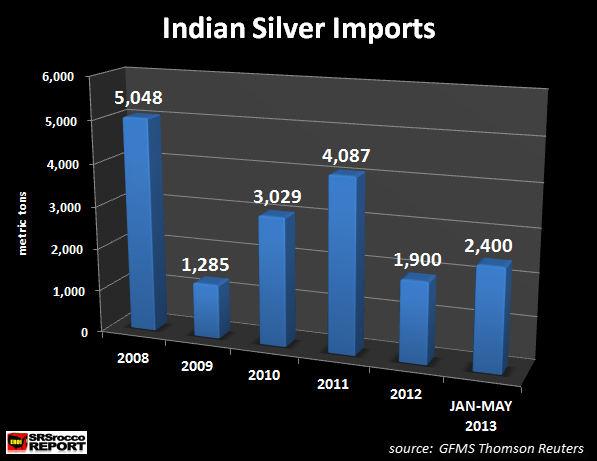 Last April, India imported 600 tonnes of silver, the biggest ever haul. But November 2011 was particularly destabilising for silver imports. This continued till December, with less liquidity in the market, bringing down overall imports. This year, however, it will be good for silver. In the case of gold, imports would be only 150 tonnes,' added Kothari. Though several nominated banks have been trading in gold, many have not yet moved completely to silver. Private lender Dhanlaxmi Bank entered the higher denomination silver retailing business on January 10, with the launch of its 'Dhan' silver bars. The silver bars are to be available in tamper-proof laminated pack in weights of 50 and 100 grams at branches across the country. "The launch of Dhan silver bars has been prompted by the success of the bank's gold retailing business. With this launch, we foresee further traction,' said Dhanlaxmi Bank, head, gold and silver, Deepak Singh. The surge in silver prices 10 months ago had led more banks toying with the idea of selling the metal in the local market. Bank of India had then joined the ranks of two lenders - Scotiabank and HDFC Bank- to sell silver bars locally. At that time, silver, which moves in tandem with gold, had risen by 71% against a 23% increase in gold. The jump in gold following the global recession of 2008 had made silver a cheaper investment option. Though Bank of India was selling gold bars outright, offering gold loans to jewellery manufacturers, it decided to step in to silver retailing after a lot of thought. In 2010, the bank's four bullion exchange branches, two in Mumbai and one each in Ahmedabad and Chennai, sold around 11,000 kilo of gold bars to its clients. In terms of gold, banks contribute 80% of the 800-900 tonnes that India annually imports. The mandate for additional banks will increase purchases and also help banks in boosting their gold lease facility to manufacturers. "Falling gold imports may be bad for the market, but is considered good for the economy. In the first two quarters, gold imports amounted to $25 billion, according to the World Gold Council. In the September quarter, imports were $11.25 billion and in the last quarter it was just $7 billion. The move to bring on more bankers will also raise the prospect of better competition and help supplies,' said Kothari. (Reuters) - Silver imports into India, the biggest consumer of the white metal, are likely to decline up to 27 percent this year on expectations of volatile prices, despite import duty remaining unchanged, the head of the country's biggest bullion importer said on Monday. Sunil Kashyap, head of Asia at Scotia Mocatta, a unit of Bank of Nova Scotia (BNS.TO), said investors in India were averse to steep and volatile changes in prices of silver, which could dent imports. Silver imports are likely to fall to 3,500-4,000 tonnes in 2012, down from 4,800 tonnes imported last year, Kashyap said. NEW DELHI -- Indian Finance Minister Pranab Mukherjee Monday removed the excise tax on sales of all gold jewelry, a move that will calm retailers who went on strike when the scope of the levy was widened in March. In the federal budget on March 16, Mr. Mukherjee imposed a 0.3% excise tax on non-branded gold jewelry. Branded-jewelry sales by companies such as Tata group's Tanishq already attracted a 1% tax. Both levies have now been scrapped, Mr. Mukherjee said in Parliament Monday as he unveiled amendments to budgetary proposals. He also raised the threshold limit for taxation on cash purchases of gold jewelry to 500,000 rupees ($9,350) from the budgetary proposal of 200,000 rupees. However, the minister left unchanged a proposal to double the import tax on gold to 4% from 2%. The budgetary measures were aimed at increasing the cost of gold purchases and curbing its consumption. Gold is India's second-largest import item by value after crude oil. But the tax rollbacks could revive the precious metal's demand in India, the world's largest gold consumer, partially defeating its objective of attacking a widening current account deficit. "Gold demand will likely improve. It's a good decision," Prithviraj Kothari, president of the Bombay Bullion Association, said of the scrapping of the excise tax. Jewelers were most worried about the excise tax as they said it required far more paperwork and increased the chances of harassment by tax officials. "The removal of excise duty is positive news for the gems and jewelry industry," said Bachhraj Bamalwa, chairman of the All India Gems & Jewellery Trade Federation. Madan Sabnavis, chief economist at CARE Ratings, said the scrapping of the tax would just about offset the impact of the weakening rupee that has pushed up local prices. Domestic gold prices are currently quoting near all-time highs at around 29,500 rupees per 10 grams, while at 0444 GMT, international spot gold was at $1,637.83 a troy ounce, far below its peak of $1,920.94. Earlier Monday, Mr. Kothari said gold demand in Mumbai, the country's trading hub for precious metals, had plummeted to 200-300 kilograms a day, compared to 1.0-1.5 metric tons a day last year, largely because of the impact of the sliding rupee. He said India's gold imports would likely total 750-800 metric tons in 2012 if the June-September monsoon rainfall is normal. le mouvement de protestation des citoyens contre leur banque centrale vs gardiennage des réserves d'or nationales , s'étend à l'inde ! 265.49 tonnes sont détenus à l'étranger dans des dépôts ou de la garde en toute sécurité avec la Banque d'Angleterre et la Banque des règlements internationaux. " pour avoir la version traduite en français utilisez le bouton traduction représenté par drapeau tricolore, en barre navigation Hardinvestor. la demande d'or est en baisse de 50 à 60% de mars 2011 à mars 2012. Remember 2009? The collapse in Indian gold demand that year offers a template for the current state of the market – and a cause for hope. In early 2009, as the Indian economy followed the rest of the world off a cliff and the rupee crumbled, gold demand from the world’s top buyer of the metal almost disappeared. In the first quarter of that year, demand was just 24.2 tonnes, down 77 per cent year-on-year, according to GFMS data. For the full year Indian gold consumption fell 19 per cent. Something similar is happening today: the Indian economy is suffering, the rupee is sliding and Indian gold demand has dried up. The country’s economy registered its slowest quarterly growth in nine years in the first three months of this year. Gold prices have hit records in rupee terms despite being rangebound in dollars, last week rising above 30,000 rupees per 10g for the first time. Dealers say that gold sales to India – traditionally the largest consumer of the shiny metal, although it looks likely to be overtaken by China this year – are down 50-60 per cent year-on-year since March. The consensus view is that Indian demand is likely to fall 20-30 per cent over the full year. "Indian demand is appalling," says one senior trader. Most recently, the monsoon season has started badly, dealing a fresh blow to Indian gold demand since farmers are usually among the keenest buyers of gold. The collapse in Indian demand is one reason why gold prices have stagnated this year. Despite a recovery from the lows of mid-May to about $1,620 a troy ounce currently, traders say that most investors are staying on the sidelines. But 2009 may be a lesson for the market. Gold traders are in agreement that the downturn in Indian consumption is a purely cyclical phenomenon; a reflection of the state of the Indian economy. That means that when the Indian economy recovers, gold demand should bounce back with a vengeance. In 2010, Indian gold consumption soared 74 per cent to a record high of 1,006 tonnes, GFMS estimates, as pent-up demand was unleashed. A similar rebound, later this year or in 2013, could be just the stimulus gold needs to regain its previous peaks above $1,900 a troy ounce. The key question is: will western investors be patient enough to wait for Indian demand to return? Since the end of February, when the US Federal Reserve dashed hopes of a new round of quantitative easing, many investors have gone cold on gold, including some of the so-called "real money" players – pension funds, sovereign wealth funds, private banks and so forth – who have been a steady source of demand throughout the bull market. Epitomising the trend, Schroders’ private wealth division announced in April that it was trimming its gold holdings. But the mood appears to have turned somewhat in recent weeks. While there has been no large-scale buying, bankers say that the trend for real money investors to reduce their gold holdings has stopped – and some are once again asking about buying. The shift is borne out in positioning data, with ETFs witnessing modest inflows since late May and investors on Comex raising their bullish bets from the lowest level since 2008, according to CFTC data. Investors are transfixed by the Fed meeting today. And indeed, if the US central bank drops a hint of further easing, that would probably be enough to confirm gold’s return to favour. But a rebound in Indian demand later in the year could be truly explosive. NEW DELHI: The second half of this year may see 20% increase in gold imports to 300 tonnes over the first six months, a bullion association has said. "Imports in the second half of the calendar year will be around 300 tonnes, higher than what we have imported in first half, which was 250 tonnes," Bombay Bullion Association president Prithviraj Kothari said. He further said the import volumes would be dependent on the price of gold in domestic market. Imports could rise if domestic gold prices stay below Rs 30,000 per 10 grams, he said. Kothari, however, said for the full year it would be less than 30% from 2011. When asked about July consumption, he said it would be dull because of lack of marriages and festival season but the demand could pick up from August. Earlier this year, the government had changed the duty structure on gold and silver from specific to value-linked, making precious metals more expensive. The import duty on gold was fixed at 2% of the value, instead of the earlier rate of Rs 300 per 10 grams. On silver, the import duty was pegged at 6 per cent, as against Rs 1,500 per kg earlier. In 2011, about 1,037 tonnes of gold was available in India, the world's biggest consumer, of which 967 tonnes was imported and the rest was from other sources like recycled, according to the World Gold Council. les importations d'or) », croit-il savoir. premier semestre cette année, de 42% à 340 tonnes. Gold imports by India, the world’s largest buyer, are set to climb for the first time in six quarters as a decline in domestic bullion prices stokes jewelry and investment demand ahead of major festivals. En 2011-2012, les exportations de bijoux en argent ont augmenté de 44% contre 30% pour les bijoux en or. L’Inde est le plus important consommateur de bijoux en argent du monde, et vient également de se trouver une clientèle en Occident. Selon Ketan Shroff, directeur chez Pushpak Bullions, les investisseurs préfèrent actuellement les bijoux en argent parce que le prix de l’or ne cesse d’augmenter. Au vu de la demande actuelle, le prix de l’argent devrait continuer de grimper. source merci à Jigé pour l'info ! histoire de freiner la demande d'or, au prétexte d'une augmentation indésirable du déficit de la balance commerciale... mais les décisionnaires sont bien conscient que ça ne pourra qu'encourager le marché parallèle ..
Hong Kong and Singapore buyers are paying premium of $5 per oz for a gold bar. Dubai buyers are paying a premium of $7-10 per Kg. Turkey was reportedly paying a premium of $25 an oz over London price. India is paying a premium of nearly $40 per 10 gms. Gold has seen a lot of physical buying interest as its price witnessed the sharpest fall in last four years. Hedge funds have made record shorts in gold trade. Reports that George Soros has cut his holdings in the past quarter are also putting pressure on the prices. And there is another report from Goldman Sachs predicting more declines in the near term. The regional presidents at the US Federal Reserves, who are asking for reduction in stimulus, are also keeping investors jittery. Gold prices have declined 19% in the current calendar year. While paper gold is getting liquidated and the ETFs are seeing redemption, interest in physical gold has picked up. The demand is so strong that now investors have to pay a premium to buy physical gold. The delivery comes with a waiting period. Its now paper players v/s the physical gold buyers! In paper futures, you can short sell even if you don't have the actual commodity to sell. As per various reports, the leveraged shorts are 10-12 times higher on comex. Even as these paper shorts are leading to prices decline, physical buying has picked up. The major buyers are in China and India who have been investing heavily in gold as the prices have become cheaper in dollar terms. Large buy orders from these markets are pushing the physical premiums to the levels not seen for longest time. Hong Kong and Singapore buyers are paying premium of $5 per oz for a gold bar. Dubai buyers are paying a premium of $7-10 per Kg. Turkey was reportedly paying a premium of $25 an oz over London price. India is paying a premium of nearly $40 per 10 gms. The coins demand from mints in the US, UK to Australia are reportedly soaring. And not just the bars and coins. Scrap gold sales have also picked up in most of these Asian physical markets. There also are theories that high volume of physical gold may slowly give Asian countries the power to influence gold prices. And while that could be few years away, at present you still have the global banks dishing out bearish reports on gold. Societe Generale says that gold has the worst 12-month outlook among most commodities. Swiss Asia Capital is expecting support to gold towards decline to $1,250 an ounce. The most bearish report is out from Credit Suisse which says that gold in dollar terms may hit $1,100 in next 12 months and break below $1,000 in coming 5 years. So while gold in dollar terms could be losing out, it clearly is not falling much in other currencies and especially in Asia. Alors là, ça dépasse tout : De quoi se mèle cet organisme? un comble pour une institution soit disant neutre d'une part, et censée représenter les intérêts des gros producteurs d'or ! Import restrictions and the war on gold in India, once the largest buyer of gold soon to be surpassed by China, has led to a surge in Indian silver imports which have doubled. Thomson Reuters GFMS analyst Sudheesh Nambiath, estimates that India’s total silver imports have more than doubled from last year, reaching nearly 3,000 tonnes in the first half of 2013 compared with 1,900 tonnes in the whole of 2012, according to the Financial Times. EU trade data show silver exports to India from the UK – traditionally the country’s top supplier – were 1,415 tonnes in the quarter to June, more than triple the previous year’s level and the highest quarterly total since 2008. “Because of the restrictions on gold, traders shifted towards silver,” Mr Nambiath told the Financial Times, adding that demand for silver jewellery was likely to rise 20% year-on-year and that manufacturers already had full order books through to December. Face à la chute de la roupie, la monnaie indienne, des voix demandent que l'or détenu par des temples soit transformé en lingots et vendu à des particuliers. Depuis le début de l'année, la roupie indienne a perdu près d'un quart de sa valeur. Couplée à une inflation dépassant les 5%, cette situation a aiguisé la fièvre de l'or des Indiens cherchant à protéger leurs économies. Pour contenir la dépréciation de la monnaie nationale, la banque centrale indienne a imposé des limitations sur l'importation d'or, en partie responsable de la chute de la roupie. Les achats d'or à l'étranger représentent en effet 61% du déficit courant indien en 2013. Selon The Economic Times, une solution originale serait actuellement examinée par la banque centrale afin d'activer le marché interne. "L'idée est de désigner une banque qui pourrait acheter l'or des temples. La banque centrale pourra ensuite l'acheter avec des roupies", explique un banquier cité par le journal économique. Dans un communiqué, la banque centrale a cependant assuré que cette solution n'était pas envisagée....... "pour le moment". Les temples indiens disposent de véritables trésors, celui de Tirupati contiendrait ainsi environ 1000 tonnes d'or. Les toits de certains lieux de culte sont également parfois recouverts du précieux métal.